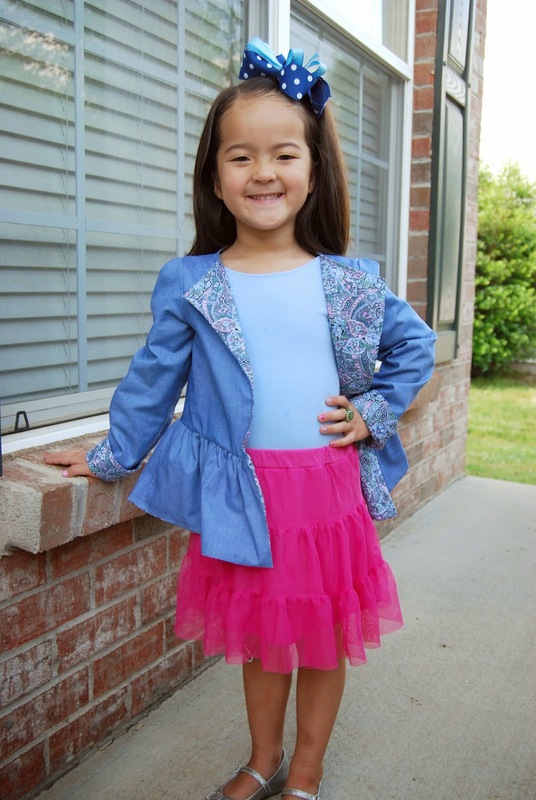 Once again, I had the pleasure of testing a PDF sewing pattern for Amelie Clothing. This time, a Reversible Blazer. I've got a thing for reversible items- bags, clothes, etc- so of course this pattern was right up my alley! 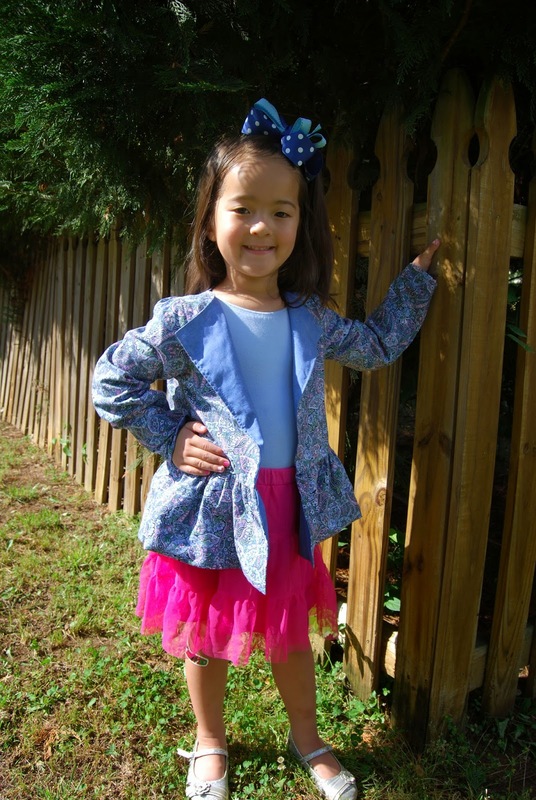 Like all of Amelie Clothing's patterns, the Reversible Blazer is written in clear, concise words. The pictures that accompany the tutorial are well-lit and aid in the understanding of the written word. I don't know if it's the fact that I'm getting quicker, or the fact that this Reversible Blazer is a quick sew, but I was able to get this one done in less than three hours (total- because seriously, what mom has three uninterrupted hours to devote to any one task???! ;-). I love the loosely gathered ruffle at the bottom- it adds a touch of femininity to the blazer. Even a beginner sewer could accomplish this blazer with good results- a real confidence booster! The funny thing about this pattern actually has nothing to do with the pattern. On the day that I sewed this it was 90 degrees outside. Hot. Humid. Sticky. Lil' Miss was a trooper to model the blazer- though lightweight- in the hot temps. outside! No worries, though, I'm sure I'll be making more of these come cooler temperature here in the Carolinas. The fabric combinations are endless and I can't wait to embellish with buttons and ribbons and ric-rac. Thank you, Susan, for allowing me to test the Reversible Blazer for you. Another winner of a pattern!